Two weeks into January…how are you getting on? Motivation levels still high? Are you leaping out of bed at 6am to get a workout in before work or are you hitting snooze and opting for sleep instead? We are now approaching the danger time. The time where it could all go wrong. And to begin with the new routine feels easy. Watching what you eat is a novelty and you cram your diet full of goodness whilst feeling lovely and smug. Enjoy this bit! It is fun and a little insight into how it could be forever if you manage to stick to it. Unfortunately, around the two week mark things begin to slip. The shine wears off. Dragging yourself to the gym begins to feel like a bore and vegetables just aren’t hitting the spot. It’s at this point you have a choice. You can give up completely (whilst telling yourself you’ll get back on it next week/ next month) or you can dig in deep and get through it. If you can come out the other side you will be well on your way to making healthy a habit. And a habit is what you want. Motivation is brilliant but it will come and go. Habits stick with you. You’ll get to the point where you don’t even question it, you just do it. If you have a calendar, sit down each week and block out times for exercise. Stick to it like you would stick to a doctors appointment. Once it is written down it is non-negotiable. Do the same with food. 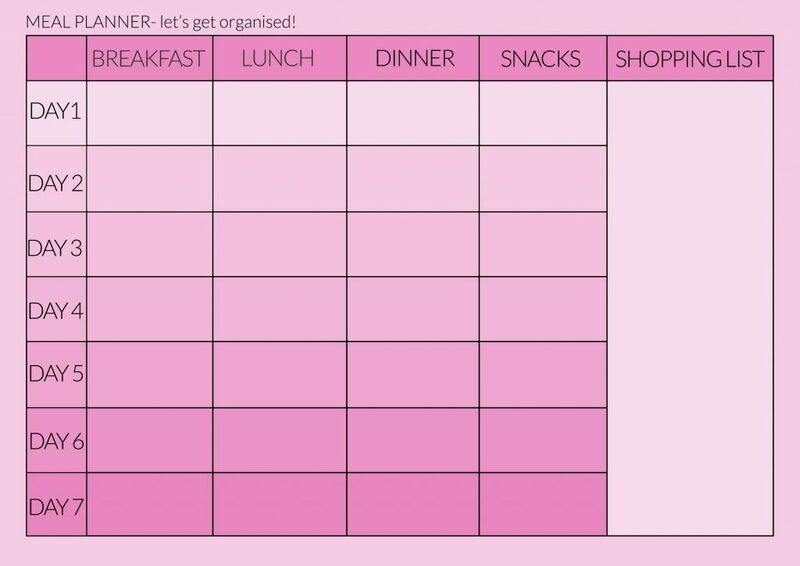 Print off the blank food planner at the bottom of the page and each weekend, without fail, sit down and plan your meals for the following week. Even if you go off plan a couple of times, having something to refer to will generally keep you on the straight and narrow. This is one of the most important parts of my 8 week Kickstart Programme. Each week my fabulous ladies sit down, get their plans done and share them in our closed Facebook group. Don’t let your brain kick in…if you do, it will very quickly come up with 100 excuses with why you can’t exercise today or why a doughnut is perfectly acceptable. If these thoughts start creeping in, get straight out of your head by getting on with it. When you exercise you rarely think of anything else. You just do it. Sometimes your brain isn’t your friend. This is exactly why I set a workout of the day, an article to read and a food diary to fill out each day of the 8 week Kickstart Programme. It means, every day my ladies just log into their private online area and their tasks are ready and waiting. No thinking needed! And that brings us onto excuses. It’s time to be honest with yourself. We all tend to be very good at convincing ourselves and others that we just can’t exercise because: we are feeling a bit ill; we’ve injured ourselves; we didn’t sleep well last night; we are just too busy/ stressed, etc, etc, etc. As a personal trainer and bootcamp instructor, I have pretty much heard all of the excuses under the sun. Illness – unless you have the flu (and I mean genuine flu where you are so weak you wouldn’t even bother picking up a £50 note on the floor next to you) or a chest infection then most of the time exercise will help. You might have to adapt it slightly and instead of a full on HIIT class, go to yoga instead or go for a walk instead of a run…but you will be able to do something. Time – this one comes down to prioritising and planning. 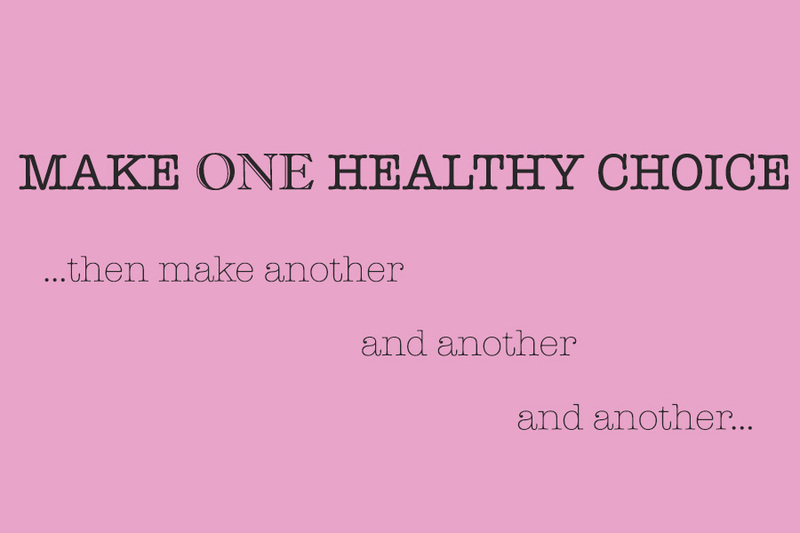 Your health should be number 1 on the list. You need to make the time to exercise and eat well. If you are super busy, make exercise fit into your life by planning quick 20 minute sessions. However you need to do it, just do it. Tell your partner/ best friend/ family what your aims are and why you want to achieve them. Ask for their help and support. Once people know what you want to achieve and why, most of the time they will encourage and support you through it. Support is priceless. FYI – There will always be those that do the opposite and try to throw you off course (sometimes subconsciously, sometimes deliberately), minimise contact with them…it just isn’t helpful. Surround yourself with positive people that build you up. Support is a massive part of why my Kickstart programme gets such amazing results. The closed Facebook group means someone is always on hand to help/ encourage and for my VIP members, I check in with them every single day to give feedback and make sure they are ok. Exercise and eating well is so much more fun when you’ve got someone to do it with. Plus if you arrange to meet a friend for a swim/ walk/ class then you are less likely to cancel or let them down. If you don’t have anyone to do it with, actually book into things or arrange a PT session. Once it is booked in, there is no going back! 6. Why are you doing it? What was the reason you started? This all comes down to remembering what you want to achieve and why. It’s why goal setting is really important. Keep in mind the bigger picture but also have little goals to try and hit along the way so can see your progress. Pin up your goals or create a vision board of all you want your life to be and pin it up somewhere you can see it. Good health really is everything. Being fit, healthy and full of energy will enable you to live life to the full. Eat crap and you’ll feel like crap. Skip the workout and you’ll spend the rest of the evening feeling guilty. Every time you make a healthy choice or get your workout done, make a mental note of how you feel at that moment. Remember very few people actually look forward to exercise, it’s the feeling after that makes it all worthwhile. If you have been doing ok by yourself but can feel that you are starting to struggle, now is the perfect time to get a bit of extra help. You can sign up to my 8 week Kickstart Programme at any time and with my help you WILL continue to progress and achieve your goals. Just imagine where you could be in 8 weeks if you started today. Pop over and check it out! And if you want a bit of inspiration and motivation delivered to your inbox each month, then sign up for my newsletter. Finally I am happy to have a chat and help you with whatever you’re struggling with – send me an email (lorna@alittlemorefabulous.co.uk) and we will get you ready and raring to go! Oh and if you haven’t already ‘liked’ my Facebook page, I’d love you forever if you could do it now by clicking here! Kick off 2018 with January Challenge!